Everything starts from a simple dream, for Myren Garcia, founder for Network of Enterprising Women (NEW), her dream was to give a helping hand to her fellow women entrepreneurs. But little did she know that what she created ten years ago would bloom into a such a community of motivated and driven women who ventured into the world of business. 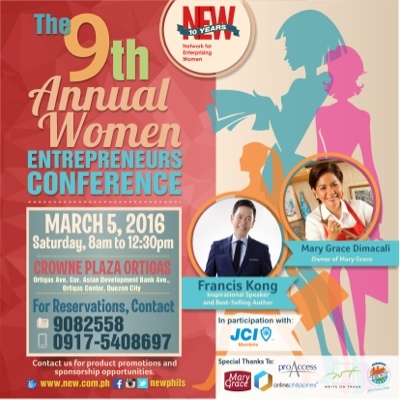 To commemorate a decade of NEW, the 9th Annual Women Entrepreneurs Conference is at place on March 5, 2016 at the Crown Plaza-Ortigas. The conference will feature best-selling author and inspirational speaker Mr. Francis Kong and none other than, one of NEW's prime members Ms. Mary Grace Dimacali of Mary Grace. And to further inspire more women to respond to their entrepreneurial callings, the conference will also guest long-time NEW members and women behind Milea, Imagere, Strip it, Smart Concept, Status Hair Salon, Dreambook Journal and Sweet Blooms Pastillas. The half-day conference will be a Pandora's box of business ideas, tips and advices from real-life business women who braved the world and took on the plunge. They will also be sharing their insights and forecast on the future of women entrepreneurship. From modern advancements, trends and anticipated developments of new market niches, NEW's 10 year anniversary will surely gear up to a better, evolving and innovating strategies for all ladies with an entrepreneurial dream. NEW 9th Annual Women Entrepreneurs Conference is brought to you by Mary Grace, Online Philippines, ProAccess, The French Baker, JCI Manilena and Write On Track. To learn more about NEW 9th Annual Women Entrepreneurs Conference, visit www.new.com.ph or facebook.com/newphils. To register, visit new.com.ph/event-registration-form.